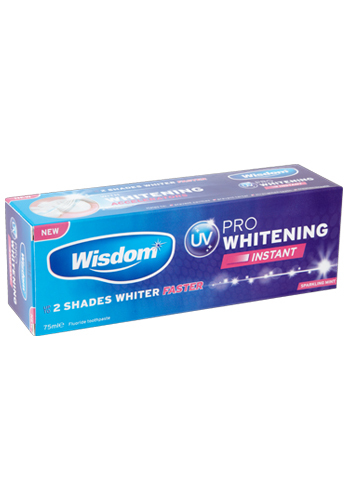 Wisdom UV Pro Whitening Instant contains WHITENING ACCELERATORS to boost cleaning power without scratching, plus a unique stain prevention system that delivers up to 2 SHADES WHITER TEETH – FASTER. 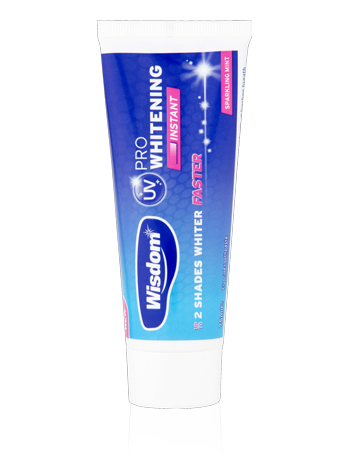 The advanced low abrasion formulation is safe and gentle for daily use and works INSTANTLY to remove stains without tooth wear leaving sparkling teeth and a whiter smile. Ingredients: Sorbitol, Aqua, Hydrated Silica, Pentasodium Triphosphate, Sodium Lauryl Sulfate, PVP, Sodium Monofluorophosphate, Aroma, Cellulose Gum, Sodium Saccharin, Mica, Silica, Cl 42051, Cl 17200, Cl 77891.